The most complete yoga home study program available! The Science of Yoga is probably the most complete and detailed yoga study available! Easy to follow, detailed illustrations and videos, easy to understand language of all the benefits and science behind yoga! What is The Science of Yoga? The Science of Yoga is the perfect Yoga Home Study Course for learning everything about yoga that you want to know. More importantly, it helps you to step-by-step build your own rejuvenating, health-enhancing home yoga practice ... in just a few short months. The Science of Yoga is so easy to use that even a total beginner will love it. It's also so thorough and indepth that experienced yoga practitioners (yoga teachers too) will be able to take their practice to the next level. If you've already tried my online yoga training programs, I don't need to convince you about how easy they make learning yoga, and what a great value they are too. You already know that! The Science of Yoga is my newest online yoga training program, and after 2 years of preparation, it's finally ready for you. What Makes The Science of Yoga So Special? The Basic Yoga Trainer, my introductory yoga training program, has been incredibly popular ever since its release almost 2 years ago ... and my 1-year Yoga Master's Certificate Course is unrivaled for its depth and comprehensiveness. But for quite some time now I've been getting a lot of requests for something inbetween -- for a yoga course that goes beyond the basics but doesn't demand hundreds of hours of study and practice. The Science of Yoga Is It! The Science of Yoga is the culmination of my years of studying and practicing yoga at its source, in India, coupled with my unique experience pioneering the teaching of this powerful science through home-study and online training. The Science of Yoga is the most concise, yet indepth yoga training available online. From the reviews it has gotten so far, it might even be among the most concise and indepth yoga training available anywhere! I've gone through great pains with The Science of Yoga to create a yoga course of great value to all. The unique, step-by-step format makes it accessible to beginners, while the depth of information within it will expand the understanding and abilities of yoga practitioners of all levels, yoga teachers included. With all the confusions and misinterpretations surrounding yoga today, The Science of Yoga provides much needed clarity and guidance. You have been asking for it for a long time and now I'm happy to announce that finally, it has arrived! Instantly Rejuvenate Your Body and Refresh Your Mind with 21 secret yogic breathing practices certain to give you an immediate and lasting energy boost. Just a few minutes a day of practice is all it takes to feel 10 years younger again! Live Longer and Stronger with over a dozen ancient yoga dietary secrets - and the regular practice of yoga which is proven to improve your physical and mental stamina, and even make you live longer too! Restore Balance to your BODY, your MIND and your LIFE - with 15 special polarity and yoga energy balancing techniques. Practice these regularly and you'll feel like your good "young" self again in no time! Clean Out The Toxins That Cause Premature Aging and Disease (you're more poluted than you think!) with 6 daily yoga practices that are so simple and take only 5 minutes to do. You'll be amazed at the rejuvenating results! Get All the Tools to Practice Yoga, at Your Fingertips (It's like having a private yoga teacher in your own home) - including detailed instructional guides, video demonstrations and appendices of complete yoga routines to follow along with. Remove All the Mystery, Superstition and Flimsy Science From Yoga (finally learn what yoga all about), with instruction on the principles and theories behind all the practices so that you'll really know how to practice yoga properly - and how to practice on your own too. and a whole lot more ... see for yourself! 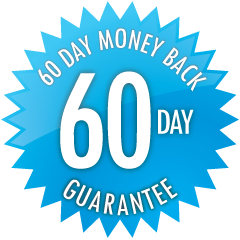 If after 60 days you are not completely satisfied for any reason at all, simply say so for a full, courteous, no questions asked refund. I would like to commend you on "The Science of Yoga." In my estimation you have written a course worthy of leather binding and an honored place in the finest world libraries. Yoga today lacks in the understanding and teaching of the deeper meaning and spiritual intent behind the practice. Your course does a masterful job of restoring that foundation for western readers and yoga practioners alike. I applaud you.. it is indeed a masterful work..
With The Science of Yoga, Yogacharya has once again crafted an inspirational guide for all students of Yoga. As I read, I felt just like I do when physically next to Yogacharya. I felt as if I was truly in the presence of a Master and I was aware of being under the umbrella of the sacred teachings of great lineage. With this course one can confidently embark on or deepen a home practice. Don't be fooled by how convenient this step-by-step Yoga learning program is. This is the entrance to a profound, life-transforming experience. As a busy mom who had a hard time fitting in Yoga instruction, I am so thankful to have found a home-study course that offers a powerful new living experience. Now there is no need to try to *fit* Yoga into my life, as this new way of living makes the rest of my life fit together beautifully. The pace of the course is perfect in our world of overwhelm. The instructions are very articulate and the use of words, pictures, and online video links assures the student correct movement. However, this course goes way beyond movement; it embraces the wisdom of the ages… in an age where that wisdom is badly needed. I highly recommend “The Science of Yoga” for those seeking to deeply understand the Yoga way of living and to find a greater sense of peace in the world. I wish to commend Yogacharya Michael for his considerable efforts in creating The Science of Yoga home study course. I'm delighted to see his teaching presented as clearly, succinctly and accessibly in The Science of Yoga as he himself would have done. I have no hesitation in recommending this course to any and all students of Yoga, novices and experienced practitioners alike. Yogacharya Michael has understood the true nature of yoga and is making a great effort with his Science of Yoga course to propagate it in its pristine purity through the modern facility of the internet. This is a true union of the ancient and the new, for the teachings are as ancient as they can be, yet, the methods of instruction are the most modern possible. May my Guru and father, Yogamaharishi Dr Swami Gitananda Giri Guru Maharaj and my beloved Guru and mother, Ammaji, Meenakshi Devi Bhavanani bless us all for the success of this noble endeavor to spread the message of classical yoga to all nooks and corners of this world. PLEASE NOTE: The Science of Yoga is a digital product (pdf files and online streaming videos). No physical products will be shipped. After your payment has been processed, you will receive instant access to all the material for this yoga course.